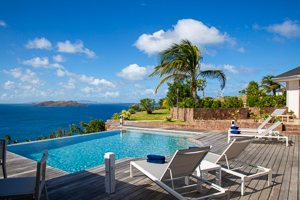 Villa UJV 240, also known as L'Abricotier, is located in Pointe Milou, St Barts, with a spectacular view of the ocean. This villa is tastefully decorated in shades of periwinkle blue, beige and off-white. One enters through the front door via a large, wide-open space comprising of a living/dining room. Three walls face the terrace/pool, and slide up and down with the aid of a remote control, affording the option of having an immense space or the protection of a closed area. There are also dark bamboo shades on all three walls, which one can pull down to protect against afternoon sunlight. This dining room/living area opens up onto a tiled, covered terrace, which then continues out onto the pool/terrace and view. The pool deck area is teak with teak lounge chairs. Along one side of the pool there is a fully-equipped wet bar with bar stools. A lush garden frames the front and right side of the pool, with an open shower overlooking the sea. The kitchen is modern and is fully-equipped with a stainless-steel stove/oven as well as stainless-steel counter tops. A breakfast bar opens onto the dining/living room area. The 2 bedrooms are located 3 steps up on a second level, each room containing French doors opening onto a small private terrace. The floors on this level are laid out in exquisite bamboo wood. Each bedroom has a large, beautifully-tiled bathroom with dual sinks. There is ample closet and storage space within the villa.